The 5-day tour to Battambang will be a good opportunity to get familiarized with the Khmer life style, thus offering you the full insight of Cambodian culture. A variety of fruits are added incentives for this destination. 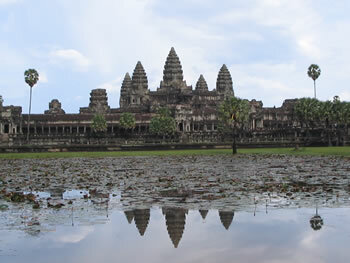 - Upon arrival at the Phnom Penh International Airport, we will get transferred to the hotel. Then we have a city tour: visiting the only one hill in town with sacred sites called Wat Phnom, and to the Independent Monument. After the lunch break at a restaurant, in the afternoon, we visit Royal Palace, one of the most beautiful samples of Khmer palace, which allows us to visit the precious Throne Hall, Prasat Khemarin, Prasat Samren Phirum, Hor Preah Khan, Chan Chhaya, and Silver Pagoda where the king regularly does the warship. Then we move to the nearby National Museum where is collective of post-Ankorian antiques. Then we go through the River Front Park whose scenery is much worth shooting before experiencing the exciting boat cruise along the Mekong River bank to see the lovely Phnom Penh city at night with breathtaking view along the river. At the end of the day, we will have dinner at the local restaurant. After the breakfast at the hotel, we start to leave for Battambang Province, the Cambodia’s second largest city known as the elegant riverside town. Having the hotel checked in and a short break, we visit the Provincial Museum, which is of collections of historical antiques. Then we start the city-tour around Battambang, the province best known for all tastes of fruits. We will have the dinner at the hotel. Finishing the breakfast at the hotel, we start the trip to Banan Mountain and Sampeo Mountain, the Historical Mountain, which we can get fresh air and listen to the natural music of the forest, and then we visit the pagoda and temples which stand impressively on the top of the mountain. After lunch at the local food shop there, we then continue the trip to relax and to swim at Kam Peeng Puoy Lake, the cosmic lake which is built by Cambodian People during the Pol Pot regime. On the way we can drop in some other tourist’s destinations like Phnom Andoek, and Turtle Hill. After have a look at sunset, we back to town for dinner. After breakfast at the hotel, we visit Ek-Phnom Temple, which is built during 11th century. The scenery of the ancient temple and fresh air would help us relax peacefully. After lunch, on the way back to Phnom Penh, we would stop off at some terrific view along the way for the pictures as well. As we arrive at Phnom Penh, we are on the city tour to witness the spectacular Phnom Penh at night time before dinning out in a nice restaurant.